^ Tsitselikis, Konstantinos (2013). "A surviving treaty: the Lausanne minority protection in Greece and Turkey". In Kristin Henrard. The interrelation between the right to identity of minorities and their socio-economic participation. Leiden: Martinus Nijhoff. pp. 294–295. 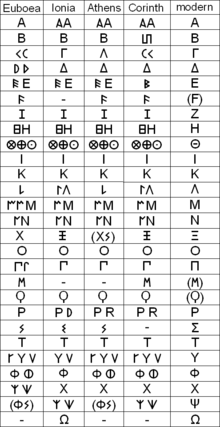 ^ "Cypriot syllabary". Britannica Academic. Retrieved 2017-08-01. Alexiou, Margaret (1982). 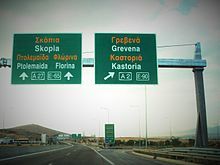 "Diglossia in Greece". In Haas, William. Standard Languages: Spoken and Written. Manchester: Manchester University Press. pp. 156–192. ISBN 978-0-389-20291-2. Atkinson, Quentin D.; Gray, Russel D. (2006). 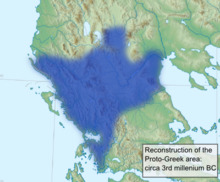 "Chapter 8: How Old is the Indo-European Language Family? Illumination or More Moths to the Flame?". In Forster, Peter; Renfrew, Colin. Phylogenetic Methods and the Prehistory of Languages. Cambridge: McDonald Institute for Archaeological Research. pp. 91–109. ISBN 978-1-902937-33-5. Babiniotis, George (1992). 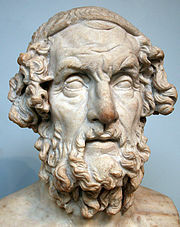 "The Question of Mediae in Ancient Macedonian Greek Reconsidered". In Brogyanyi, Bela; Lipp, Reiner. Historical Philology: Greek, Latin and Romance. Amsterdam and Philadelphia: John Benjamins Publishing Company. pp. 29–40. Dosuna, Julián Víctor Méndez (2012). 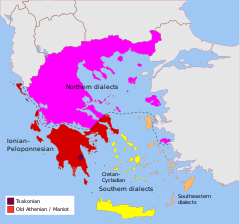 "Ancient Macedonian as a Greek Dialect: A Critical Survey on Recent Work". In Giannakis, Georgios K. Ancient Macedonia: Language, History and Culture (in Greek). Thessaloniki: Centre for the Greek Language. pp. 65–78. Holm, Hans J. (2008). "The Distribution of Data in Word Lists and its Impact on the Subgrouping of Languages". In Preisach, Christine; Burkhardt, Hans; Schmidt-Thieme, Lars; Decker, Reinhold. Data Analysis, Machine Learning, and Applications. Proceedings of the 31st Annual Conference of the Gesellschaft für Klassifikation e.V., Albert-Ludwigs-Universität Freiburg, March 7–9, 2007. Berlin-Heidelberg: Springer-Verlag. pp. 628–636. ISBN 978-3-540-78246-9. Renfrew, Colin (1973). "Problems in the General Correlation of Archaeological and Linguistic Strata in Prehistoric Greece: The Model of Autochthonous Origin". In Crossland, R. A.; Birchall, Ann. Bronze Age Migrations in the Aegean; Archaeological and Linguistic Problems in Greek Prehistory: Proceedings of the first International Colloquium on Aegean Prehistory, Sheffield. London: Gerald Duckworth and Company Limited. pp. 263–276. ISBN 978-0-7156-0580-6. Renfrew, Colin (2003). "Time Depth, Convergence Theory, and Innovation in Proto-Indo-European: 'Old Europe' as a PIE Linguistic Area". In Bammesberger, Alfred; Vennemann, Theo. Languages in Prehistoric Europe. Heidelberg: Universitätsverlag Winter GmBH. pp. 17–48. ISBN 978-3-8253-1449-1. Tsitselikis, Konstantinos (2013). "A Surviving Treaty: The Lausanne Minority Protection in Greece and Turkey". In Henrard, Kristin. The Interrelation between the Right to Identity of Minorities and their Socio-economic Participation. Leiden and Boston: Martinus Nijhoff Publishers. pp. 287–315. Mallory, James P. (1997). 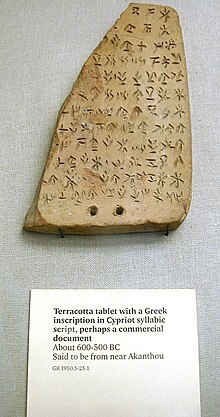 "Greek Language". In Mallory, James P.; Adams, Douglas Q. Encyclopedia of Indo-European Culture. Chicago, IL: Fitzroy Dearborn Publishers. pp. 240–246.